Plans for the block-deep Starrett-Lehigh building on Manhattan’s far west flank just below Hudson Yards have been in discussion since the building was purchased by RXR Realty in 2011. 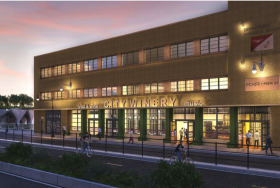 RXR recently announced that the former freight terminal, built in 1931 and named a city landmark in 1986, will get new public life as a huge event and expo space, plus retail and a food hall. The 43,000-square-foot project will be designed by ICRAVE, who brought LeDistrict to downtown and are creating another food hall in nearby Hudson Yards. The Brooklyn Navy Yard and the area surrounding it continues to expand and live up to predictions calling it the city’s new creative hotspot. Just a few months after the Navy Yard and developers broke ground on a nine-story mixed-use creative and manufacturing project at 399 Sands Street, RXR Realty has announced plans to renovate a 10-building, 650,000-square-foot block-long complex at the site of the former Mergenthaler Linotype Company printing press factory, across from the Yard. 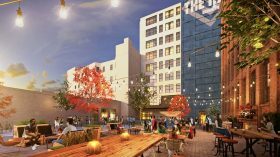 The refurbished complex will be home to industrial, design, and office space, with ground-floor retail, and restaurant tenants.